Flavonoids constitute a large group of polyphenolic compounds that are known to have antioxidant properties, through their free radical scavenging abilities. They possess a chromone (γ- benzopyrone) moiety, responsible for eliciting many pharmacological activities. Even though, natural flavonoids are highly potent, owing to their poor solubility, they are less used. Therefore, attempts have been made to improve their stability, solubility, efficacy and kinetics by introducing various substituents on the flavone ring. For nearly the last two decades, flavones were synthesized in our laboratory by simple, convenient and cost-effective methods, with the knowledge of both synthetic and semi-synthetic chemistry. In this direction, it was considered worthwhile to present an overview on the synthesized flavonoids. 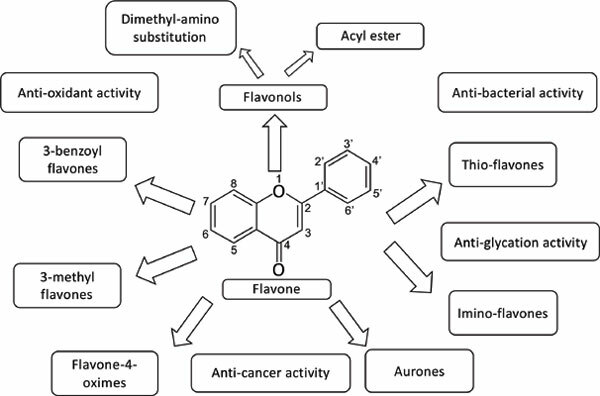 This review creates a platform for highlighting various modifications done on the flavone system along with their biological activity. Flavones, chalcones, aurones, anti-oxidant, anti-cancer, anti-bacterial activity.